Kinda early to be using that G word for a week, but I am. Are you having a Great Week? Is the last person you talked to having a GREAT Week? Today is Wednesday 05/21/V3.4 & it is Elaine’s, Andrew’s, & William’s Birthday. Happy Birthday folks. Good Day yesterday. As I announced Team What’s Bocce? won our game. We no longer have the prefect record. Then went to Cantina Laredo for a special. The pork tacos are amazing & also had the chicken. We played McGrath North law firm. Great T-Shirts. The word of the day is abecedarian which is a person who is learning the letters of the alphabet. 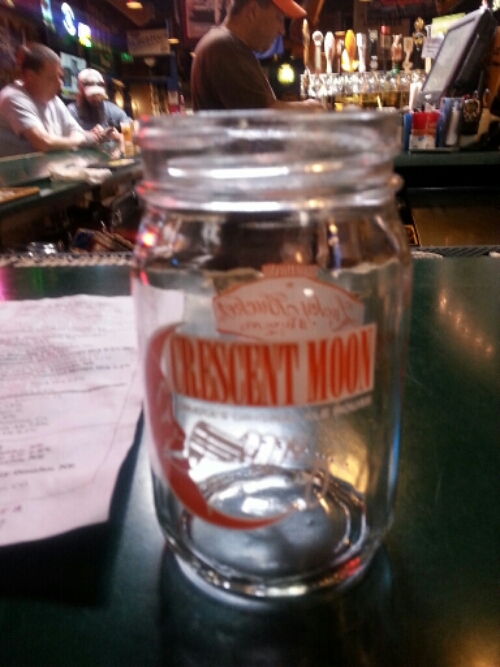 Got a sweet pint glass at Crescent Moon. I had a belly flop out of it. I also took a phone call & tried to create an event on facebook, which was a resounding failure. Just another reason why it is the worst social network. The difference in platform usage & failure shouldn’t happen. So Chip Maxwell might announce that he will run for the House of Representatives today. I don’t approve or appreciate that effort. 3 people running means the vote will be split. I’ve said it before & I’ll say it again. You had a chance to be on the ballot & get interviewed by the voters. You didn’t do that, now isn’t the time. The registered party members need to vote for their candidate. My choices didn’t win, but you can bet that I’ll vote & support the winner of the primary. That’s what I do & that’s what I expect. Have an Awesome Sauce day like me.